These are actually Dr. Doherty’s nails. Yes, he is a man. A method of enhancing one’s looks, a finishing touch to one’s fancy image, a tool for one’s artistic expression – nail polish, while far from being a necessity to use, has gained a recognition, mostly among ladies, for its attention-attracting qualities. A well-done manicure earns you several respect points, and artistic nails may very well bring you an instant fame. And what variety of nail polish goes into the process! Classic, glowing in the dark, neon, glittering, and new ones keep getting invented and discovered. Nail polish gets safer, while the choice gets wider. This Saturday, we were just about to discover how long a way has nail polish gone, what it is made of, what chemistry (and physics) keeps it on the nail, and a lot more! It is always fun to witness the dissection of things that we encounter on a regular basis in our lives. The Science Circle amphitheatre, now taken an autumn look thanks to the effort of The Science Circle’s own Jawsome (Jes Cobalt), had no shortage of curious residents, despite an early hour of the weekend day. The presentation had been done by Paul Doherty, PhD., known under the name of Patio Plasma in Second Life – and what made it even more interesting is the fact that he is a physicist, not a chemist, and what’s more, we have had actual chemists in the audience! However, judging by no corrections coming from the audience, a physicist can make a presentation on chemistry, too. If you are inclined to see the full version of the presentation, there will be a video of it available soon! The presentation took off with the basics. 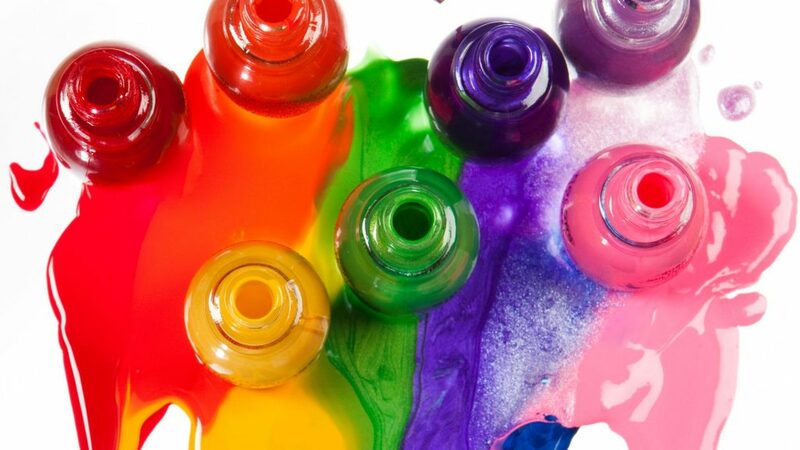 Nail polish comes out as a combination of different ingredients, which form the end substance all together. The basic component is nitrocellulose – a compound which has a wide range of applications, mainly in coating (technically, nail polish IS coating! ), while being highly flammable (inspiring, huh?). Nail polish comes in many colours, and the dye used to achieve a certain colour is a separate component that differs depending on the colour the manufacturer needs – there are even certain dyes capable of penetrating the nail and lingering on it after the nail polish removal. There are other components contributing to givin the nail polish necessary qualities – adhesive polymers (resins) that adhere nitrocellulose to the nail (while making it less brittle and glossier), plasticizes that make the nail polish flexible after drying, thickening agents that allow for the suspension of nail polish while it’s not in use (have you ever noticed that while the nail polish “dries up” in its bottle, it liquefies pretty quickly when you shake the bottle up?). There is plenty more going into the bottle of nail polish – it takes a chemist to have a look at the ingredients list and make sense of everything. Applying base coat before the nail polish comes with a lot of benefits. High on resins, base coats adhere both to the nail AND nail polish. Solvent allows them to dry fast and not wait long before applying the polish itself. There are also ridge-filling base coats. Ridge removal procedure thinners the nail and makes it more fragile, therefore not recommended – so ridge-filling base coats would be a great and safe solution! It has been mentioned already that some nail polish dyes are able to penetrate the nail, and applying base coat prevents that as well. A certain type of nail polish, known as gel, has got a lot of attention in this presentation. Its main quality is being long lasting – up to two weeks, comparing to regular nail polish which stays on the nail for up to a week. Its basic component is methacrylite polymer, the main quality of the gel is that it does not dry, but its hardening is achieved through the process of polymerization by exposure to the ultraviolet light, also known as “curing”. The bonds resulted through the polymerization are strong enough to “keep” the gel “together” for all the time it’s on the nail, and its behaviour on the nail therefore differs. While the regular nail polish is chipping from the nail, gel “shrinks” when polymerized, exposing the edge of the nail, but staying a whole piece. When it is time to remove it, gel is harder to take off, and usually requires soaking the nails in acetone for about twenty minutes before it is soft enough to come off. A worrying discovery was the very close similarity of nail polish compound to car paint one – in fact, nail polish has got patented only a year after the car paint patent. Dr. Plasma took care of it, listing the most dangerous nail polish ingredients at the end of the presentation, but then, we have learned that nail polishes contain some or all of those in minuscule amounts that are way below the minimal dose considered dangerous. Obviously, any exposure to chemicals has certain consequences, but now we know that it is safe for life to drink it use nail polish if we really want to – we have science on our side! If you did not understand the chemical part of the report or the presentation (watched on video or live), it may be a slight relief for you to know that I did not either. However, this presentation has demonstrated that even such complex chemical product as nail polish can be broken down to a set of components and processes that are much easier understood alone, but work together within one system. Will it be an inspiration for somebody to get deeper into exploring chemistry as a whole, knowing what kind of miracles it can perform? We believe so!